After reaching Udaipur, check-in at the hotel. Evening free to explore Udaipur and leisure activities. Leave for the city tour and visit City Palace, Saheliyon-ki-Bari, Pratap Memorial, Jagdish Temple, Gulab Bagh, Pichola Lake, Fateh Sagar Lake etc. Leave for Chittorgarh. Evening free to explore the city. It will include Vijay Stambh (Victory Tower), Kirti Stambh (Tower of Fame), Rana Kumbha’s Palace, Meerabai Temple, Government Museum etc. Leave for Pushkar. Visit Brahma Temple, Pushkar Lake, Savitri Temple in Pushkar. Evening is free for leisure. Leave for Bikaner. In the evening visit Junagarh, Lal Garh Palace , Camel Research Farm etc . Leave for the city tour of Bikaner. It will include Ganga Golden Jubilee Museum, Deshnok (Karni Mata Temple), Laksminath Temple etc. You can also enjoy the Camel Safari. Leave for Jaisalmer. In the evening visit Jaisalmer Fort, Patwon-ki - Haveli etc. 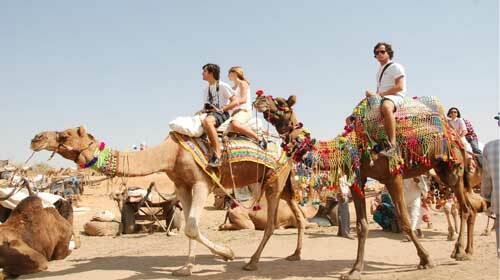 Leave for the city tour of Jaisalmer and visit Sam Sand Dunes, Gadsisar Lake, Tazia Tower, Manak Chowk and Havelis etc. Leave for Jodhpur. After reaching Jodhpur, check-in at the Hotel. Evening free to explore Jodhpur and leisure. activities. Stay at hotel. Leave for the city tour of Jodhpur and visit Mehrangarh Fort, Jaswant Thada, Umaid Bhawan Palace, Sardar Government Museum, Mandore gardens and Girdikot and Sardar Markets. After breakfast, drive towards Airport. The journey ends and you will be back to Delhi.